For over 600 years a strange spectacle has unfolded at five minutes to the hour, every hour, high above Prague’s Old Town Square. The monumental Astrological Clock on Old Town Hall’s façade springs to life: a parade of the 12 Apostles creaks by, grossly stereotypical adversaries of the Holy Roman Empire such as the Jewish moneylender and the fearsome Turk pop out of other windows; a skeleton ominously shakes his hourglass, reminding of Death and the Plague. Many legends surround this monstrously beautiful timepiece, including the dire prediction that, should the clock ever stop, the ghosts of the 27 Czech nobles, beheaded here on the square in 1620, shall rise up in that instance, and demand an explanation! However, as legends go, the most fabulous occur just two hundred meters from Old Town Square. When we enter Josefov, the oldest and most-storied Jewish quarter in all Europe, we enter another time – literally! The hands on the Hebrew Clock on the sixteenth century Jewish Town Hall run counter-clockwise, just as the poet Apollinaire claimed. Many of the Jewish Quarter’s legends revolve around the renowned scholar and companion of Rudolf II, Rabbi Low. In one of Prague’s most enduring legends, Rabbi Low appears as a powerful alchemist who creates the notorious creature, The Golem, to protect the Jewish Quarter against the world’s evil forces. 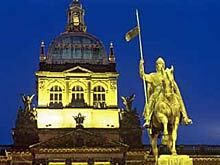 Prague’s Josefov is home to many of Central Europe’s richest collections of Jewish historical and cultural artifacts. This tiny quarter, bordered by the Vltava River, contains plentiful exhibitions ranging from the centuries-old history of the Jewish people in the Czech and Moravian lands to modern Jewish art and history. The Moorish-style Spanish Synagogue is one of the most beautiful in Europe with magnificent interiors. Upon entering the Old-New Synagogue, we sense the spirit of a people who have worshipped within its ancient walls since the mid-thirteenth century. Its 700 year-old walls conjure echoes of a lively populace of craftsmen, artists and scholars. There are also poignant memorials to the terrible losses inflicted on the Jewish community throughout its long history in the Czech Lands. The Old-New Synagogue remains a defiant witness to a time of brutal pogroms, when the Jewish community was forcibly walled within the Old Ghetto. 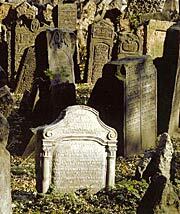 The Pinkas Synagogue, adjacent to the Old Jewish Cemetery, contains a stark stone memorial with the names of the over 77,000 Czech and Slovak Jews killed by the Nazis during the Second World War. We walk through the Old Jewish Cemetery, watched over by great rafts of rook nests high in the trees. Twelve thousand Jewish citizens were buried here between the fifteenth to eighteenth centuries. The time-chiseled Hebrew on the jumbled gravestones tells us of the vibrant lives of some of the inhabitants. In the Middle Ages, when numbered addresses were unheard of, the citizens of Prague often distinguished their residences with house signs. Many of these fanciful signs, usually over the main entrance door to a medieval house, still exist and are in use. So on this outing we may find ourselves “At the Black Eagle”; we may meet “At the Gold Star" or "At the Bowl". As we follow the winding streets of the Little Quarter, we will seek out some of the more outstanding examples of Prague’s house signs, and learn about their fascinating history. We will take the road less traveled by tourists, the twisting back streets that reveal some of the Little Quarter’s secret treasures. Hidden behind the high, thick walls and grillwork of aristocratic palaces lie magnificent gardens. Down a dim alley are age-old canals, dripping with greenery, where aged water mills still rhythmically turn in the shadows. We finish the tour at this magical city’s most enduring image: the majestic Charles Bridge, with its massive Baroque statues disposed the entire length. Construction on the bridge began at precisely 5:31 am, the 9th of July 1357 – the date had not been chosen at random. Astrologers of the time decided on this numerical combination in order to ensure the stones would hold and the bridge would enjoy a long life. Since its completion almost 600 years ago, this magnificent structure has withstood the ravages of time, war and floods. Medieval astrologers would not have been surprised. Perhaps it is the mysterious play of light and shadow on the city's "hundred spires"; or the multitude of conquering invaders and strange deaths during its 1200-year history; that gave rise to the numerous ghost stories of Prague. Let‘s unravel the untold past of the Czech capital with a walk around night Prague. It's easy to lose the sense of real time in the gleam of yellow lanterns and to believe in the existence of creatures form the other world – ghosts. Let's listen to their stories and maybe if we have luck we will meet some of them! Perhaps you'll find the inhabitants you never see, a roving assembly of phantoms that includes priests, kings, commoners and a famous 20th century novelist, to be the most intriguing. 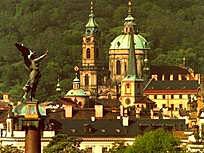 There are those that bestow upon Prague the dubious distinction of being the most haunted city in Europe. Whether that is true or not, we dare you to find out! Behind the high stone walls of Prague Castle are one of the Little Quarter’s finest treasures, and the pride of Prague – the Royal Gardens. Although just off the crowded tourist pathways, the gardens remain a world apart. To encounter them is to enter a timeless world of emerald silence. Since the Baroque epoch Europe’s finest sculptors, landscapers and architects have had a hand in creating the horticultural delights, cultivated lawns and splashing fountains which greet our eyes. The Royal Gardens are a soothing break from the hectic city noise, always alive with the changing seasons and immaculately kept up. The artistic expressiveness of the Royal Gardens is a verdant symphony.